What to know: Fifteen songs by the award-winning Swingset Mamas brought colorfully to life by imaginative sets, costumed characters, whimsical animation and 35 kids. Excellent, innovative, colorful, engaging! Really captured the kids' attention. All the children enjoyed watching the video from the beginning to the end. One child said, "I like it because I'm happy." It only took a few songs to get them up and moving. During the song about books, one child started singing the alphabet. During the song about getting dressed, an alligator tries to get dressed. The kids thought that was very funny. They all moved along to the music, especially the song, "Buckle Up" which has a rap beat. They could relate to the subject matter of all the songs and really enjoyed moving to the various beats. They also really liked the Swingset Mamas themselves and the kids onscreen. This is a wonderful video with great songs that kids enjoy. Highly recommended. 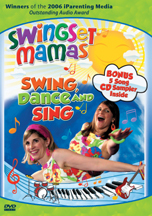 Fifteen songs by the award-winning Swingset Mamas brought colorfully to life by imaginative sets, costumed characters, whimsical animation and 35 kids. Fun extras include: live clips, "making of" segment, PLUS a five-song CD sampler!